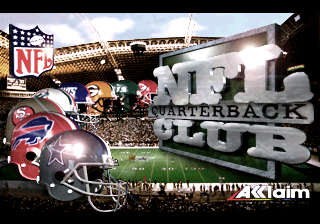 NFL Quarterback Club (ＮＦＬクォーターバッククラブ) is an American football game released for the Sega Mega Drive, Sega 32X, and Sega Game Gear. It was the first in the NFL Quarterback Club series and was followed by NFL Quarterback Club '96. In Japan, the Mega Drive version was released with the same cover used in Europe, but with some Japanese stickers applied; the posters which came bundled with the North American version were also thrown in for the Japanese version. The ROM used is the same for all regions. NFL Quarterback Club had a troubled development, with Acclaim originally acquiring the license as early as 1993. Development on the Mega Drive version was originally handled by Park Place Productions but internal troubles caused the game to be taken back in-house and reworked by Iguana Entertainment. As such, while it was originally slated for late 1993/early 1994, it was pushed back to coincide with the following NFL season. Main article: NFL Quarterback Club/Magazine articles. Main article: NFL Quarterback Club/Promotional material.